I'm sorry. Puns, I know. Does this goal fall within S.M.A.R.T. goal guidelines? Oh even yesser. I have never once entertained the idea that I would be remotely interested in owning a piece of a time share. And I mean ever. Nothing about this vacation screams "adventure" to me. It in fact, very quietly and peacefully has been whispering "relaxing escape" for the better part of a few months. I want so badly to capitalize on every second of this trip where I will not be obligated to do anything but relax and spend some actual quality time with Fiance, that anyone who tries to take even a second of that from me by trying to convince us to impulse purchase/join a time share... that person will get to witness the full range of my ability to cuss in Spanish. I'm fairly certain just thinking about that possibility of stolen time makes me want to go HAH, and a HIYAH, and then a WOOOAH, and I'd Kick them. Rude. Ha. I will go she-hulk if that's what it takes. Or just completely avoid any and all eye contact. That'll probably work just fine. But she-hulk as a back-up card. For sheezy. This morning, Mac and I drove out to the kennel where he'll be staying for a few days. I like this place; the lady is willing to work slowly with my poor Spanish, she's not scared of Mac at all (in fact, when I dropped him off, she called him her "precious"), and instead of spending a bunch of time in a cage solo, she has an open space where all the dogs just hang out all day together. Now, the quality of this is definitely impacted by the other clients she has at ay given point, but today when we pulled up there were a few labs and a boxer in the communal play area, so Mac's got some ideally-sized playmates, and he didn't think twice about wagging a happy tail g'bye before bounding into the fray. It was a happy heart moment, since he's usually got a pretty pathetic "Sarah McLaughlin Look" to shoot at you when he's being left behind (YES I LINKED THAT HORRIBLE COMMERCIAL - DON'T CLICK THAT LINK IF YOU DON'T WANT TO CRY). At the moment, I'm working on getting Bubs all set in the house and getting us packed up. Bubs is no stranger to what it means when the dog suddenly disappears and the suitcases come out. He's been lecturing me in his cranky kitty screams all day long about how rude it is to leave him all by himself in the house. But it's that or leaving him with a vet office where he refuses to eat, like a jerk. So he'll deal. 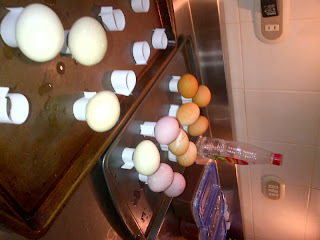 Along with all that, there was the most recent craft challenge that Mexico put forth: dying Easter eggs. 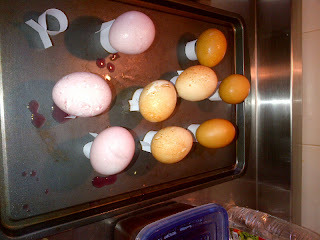 I don't think I would have bothered to dye eggs if regular commercial egg dye was actually available. I wouldn't have felt the need. But do you know what? Mexicans don't dye easter eggs. 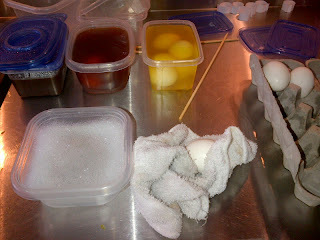 In fact, the whole bunny and egg off-shoot of the season is really foreign to them as far as celebrating the holiday. Easter is a much more religiously observed occasion here, and as such, perusing the easter decor aisle at Wal-Mart (a WHOLE lot of crucifixes), not one box of Paas dye was to be seen. 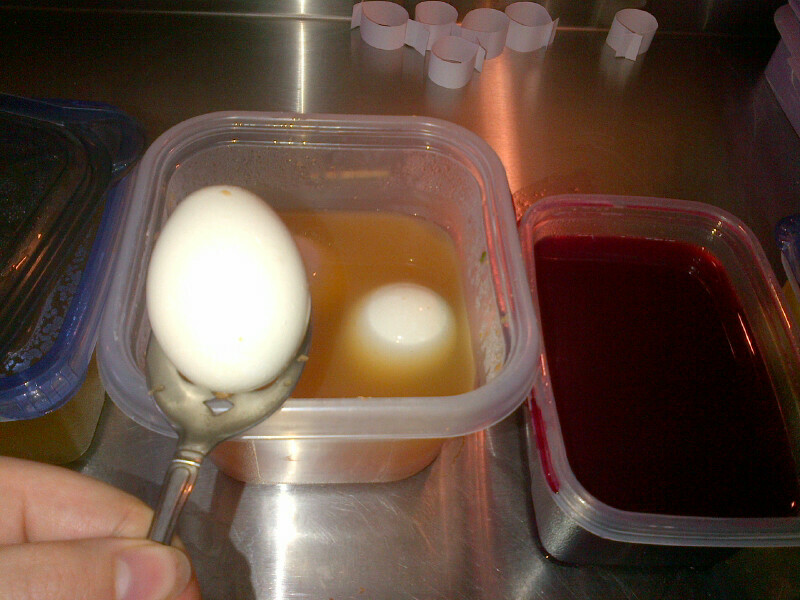 I took this as a personal assault, and vowed to dye eggs the super old fashioned way - with FOOD. 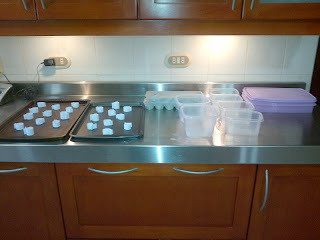 The eggs! In a "mostly" before state. Had to go in stages due to the number of pots available to me. Cleaning off the eggs with a little soapy water before going into the prepped dyes is definitely recommended. The carrot dye. Which worked exactly 0%. A bummer considering how pretty the carrot juice stains are on my juicer. 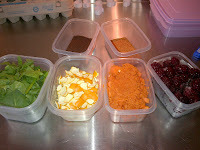 Those carrot eggs got split up and dunked back into the coffee or the berry dyes. The lighter eggs are either the orange peel or the spinach dyes, but I couldn't tell you which is which. 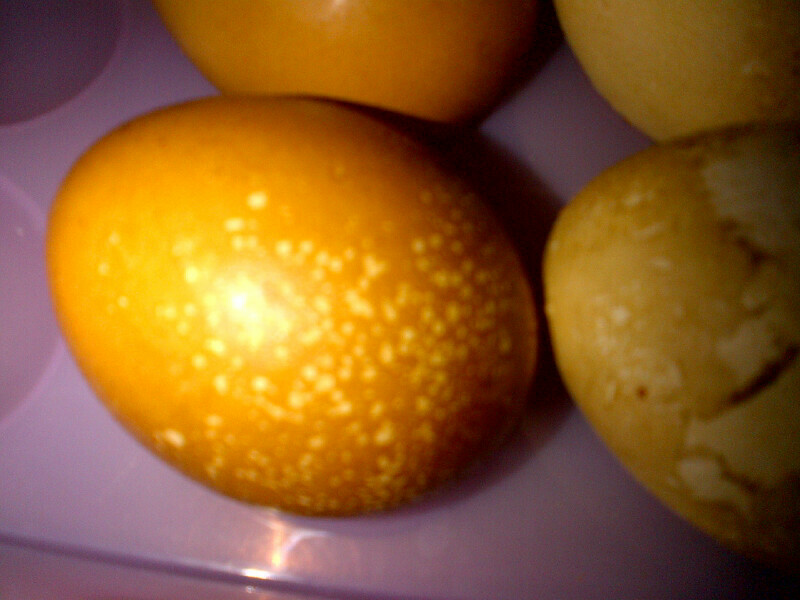 One of the chili eggs. 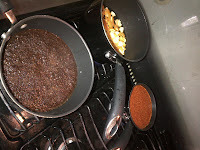 The chili powder gave the eggs a really rough texture when they came out. 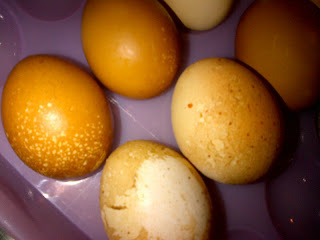 All the other eggs were smooth, these were almost cat-tongue texture. 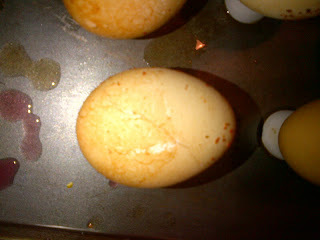 The particular egg pictured, I discovered, has a crack in it. So Fiance will be eating it, not me. Just in case. 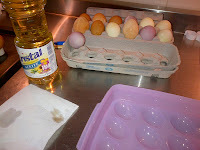 One of the articles I read suggested buffing the eggs with a little veggie oil to really finish 'em off. I can't reccomend this enough (except for the chili eggs, which couldn't be buffed due to texture). This is a comparison of the Orange peel yellow and the Spinach Leaf Green. 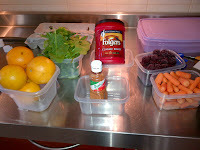 I think the Spinach is on the right. I'm not really sure. Kind of disappointing. 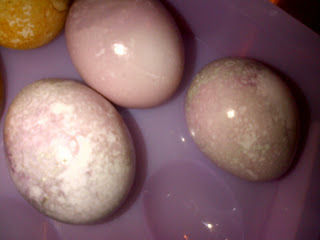 The berry eggs turned out a very pretty purple. The coffee eggs. Are by far. My favorite. I love the color, and the way the vinegar interacted with the coffee left these little speckles on each egg. I think this is particularly funny because when we were at the store getting dye ingredients, Fiance was all "why don't you just buy a pack of the organic brown eggs and call it good? Less work you know." Less work INDEED. Chili powder eggs are on the bottom, Coffee on the top. Similar in color, but you can see the texture difference in the picture. I didn't think to take a picture of the aftermath, but it took me 2 hours to wash all the dishes involved in making these eggs different colors, and I consider myself a pretty speedy dish-washer. That may or may not make this project worth it for you. 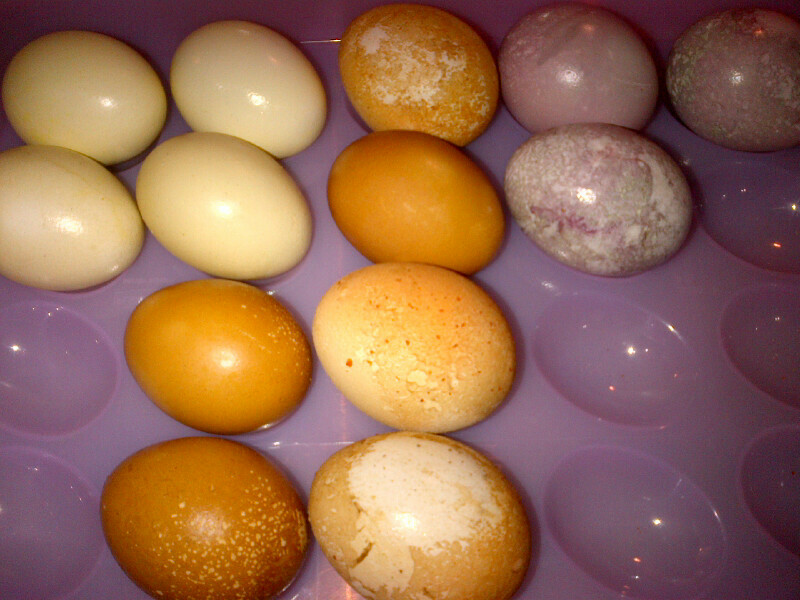 All eggs were in their dye baths for at least 2 hours. I left the yellow and green eggs in for around 4 hoping they'd get a little brighter. No luck. No, none of the eggs taste like what they were dyed in. Except maybe that chili egg with the crack in it. But like I mentioned, I'm not eating that one, and I have a sneaking suspicion that Fiance will actually like that taste combo. I did all this on Monday. About 24 hours later the dye on the berry eggs oxidized, and those eggs turned a muted royal blue color. Very pretty. I would take a picture of that, but I kind of already ate them. 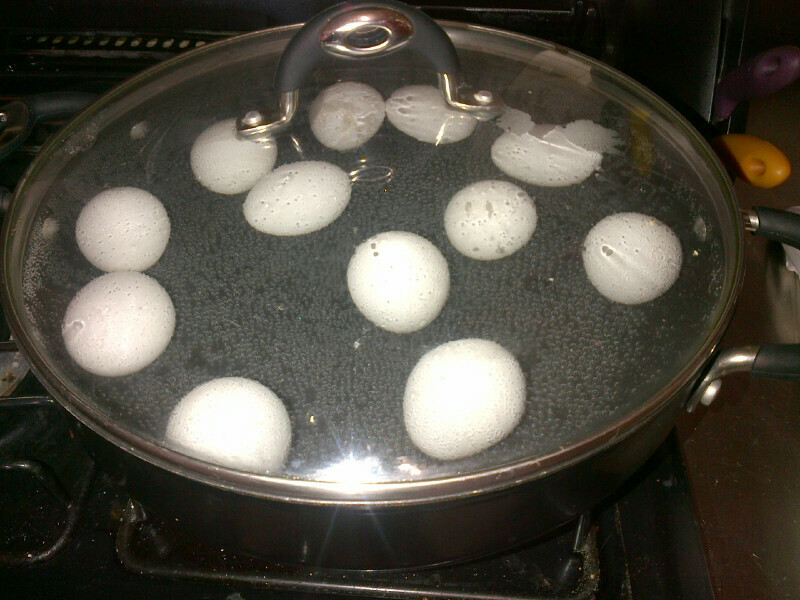 I am slightly like a Goanna around hard-boiled eggs. Coffee was not only the best outcome, but by far the easiest. 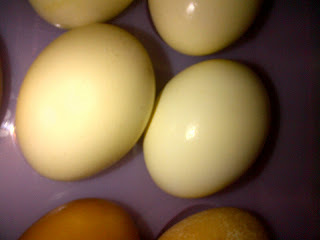 I am very tempted to dye all hardboiled eggs with coffee from here on out, if for no other reason than it will make it easy to distinguish between which eggs in the fridge are hard boiled and which are not. With the multiple colors, this activity took for-flipping-ever. Which is a bummer, because I feel like if there was any way to speed it up, it would make a cool kid-friendly project. But I doubt they would have the patience for it. Maybe a good date idea? 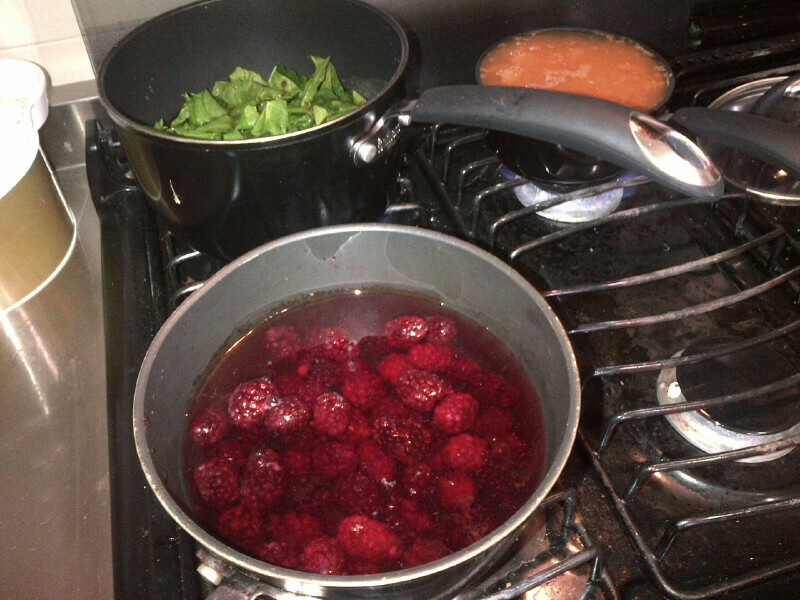 Get the eggs going and then share some wine and a movie? For my first time with natural dyes I decided to skip it, but I've done a lot with wax-resist dying that I'd like to apply here. It's easy enough- write on an egg with a white crayon or a chunk of candle wax before putting it in the dye. The dyes won't stick to the wax. It's a cool way to make designs or [hidden] messages. Are you dying eggs this year? What kind of process do you use? Any cool techniques you want to share? And with that, I'm off! I'll be back next week to [hopefully] make you all jealous over our trip to Cancun and that one time I punched a sales-person in the airport.